At the risk of sounding like I'm sucking up, this is excellent. I also like the choice of frame for it! Thanks! Actually I tried on this frame digitally. 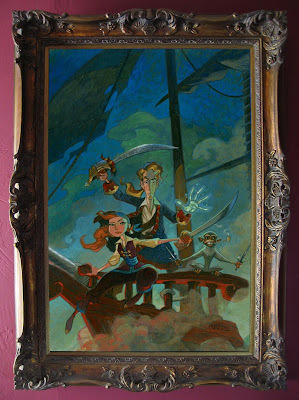 It's the frame that my "LeChuck's Revenge" oil painting lives in. I just wanted to see how it might dress up this piece. Are you signing them with pencil, like the Sam and Max ones? ordered one already (signed one)! :) Beautiful painting, sir! All the best and thanks for the inpirations! I don't know if it sounds like a braindless fan sucking Up! Oh-my-God!!!! Wow!!! Awesome! I need one of those right now!! Rad!! Fits well in the frame... do they also ship to Spain? I would LOVE to get a signed one! It's awesome, definitely got a lechuck's revenge vibe to it, which, if i may say so, is one of your best paintings. You should see if you can sell a print of the day of the tentacle painting somewhere, i'd love to have that one hanging on my wall too. kudos for being a brilliant artist, steve. Wow. I was sold on this with the previous post of just the monkey. This is all around awesome. I really dig the mottling in the sky with the intense blues. Brings back the nostalgia all over again. I wish the in-game models looked half this good. Thank you! :) I feel it as a personal gift to us, the Monkey Island fans. off topic but did you work on Indiana jones and last crusade the action game? The colorful frame really makes the piece pop! Cool. I just got my poster in the mail today! It's an absolute privilege to have it signed. I'm definitely going to look into a nice, pirate-esque frame to mount the poster in. Where did you get the frame? This is most excellent! I sit , patiently waiting, for my signed copy.